Intimate and eccentric nature circus. A tiny tent opens its doors. Plants of all sorts stand on scrap metal. ​Greenery takes over, it tumbles down from the tent’s dome, gently dripping from the masts to the floor then climbing the seats. Spectators are holding orchids in their hands. Trees grow behind the stage. Characters are eaten up by nature itself. Welcome inside PakiPaya’s off the wall-vintage universe. They are 2,4, even 6. Adrià and Noemi put on stage their own dreams and fears, they share their oddness and their passion. They will show you their most fragile interior and the craziest. Ex-rollerskater Noemi unveils herself as an Opera diva. By putting on her kitchen gloves, she strikes up one last song. Adrià, as a budding gardener puts on his tap shoes and grabs the drums. A surreal symphony rumbles, an ode to life trembles. The drumsticks give the tempo and announce the start of an absurd, funny and authentic performance. Distribution: By and with Noemí Díaz and Adria Mascarell | Directed by Karl Stets | Creation of light: Sarah Chust | Sound creation and technical management: J.Carlos Carozo | Scenography: Laura Creheut and Oriol Garcia | Costume designer: Maria teresa Martin morales – Technical construction: Uli Ulrich | Production: Cécile Imbernon – La chouette diffusion| Production: Mariona Castells. The company received the CLAP AWARD – Mueca Festival, Tenerife, Spain in May 2012; the MIRABILIA PRIZE-Mirabilia Festival, Fossano, Italy, in June 2012; the Zirkolika Prize, Barcelona, Spain- Special Audience Award in December 2012; the Jury Prize of the MiramirO Festival in 2013 and the Kremnica Prize, Slovakia in 2016. In 2015, the team moved near Barcelona and transferred the company to Catalonia for the production of its new creation Toca-toc. Sylvia Botella, Contributrice, Conférence inaugurale / ESAC / 20 avril 2018. 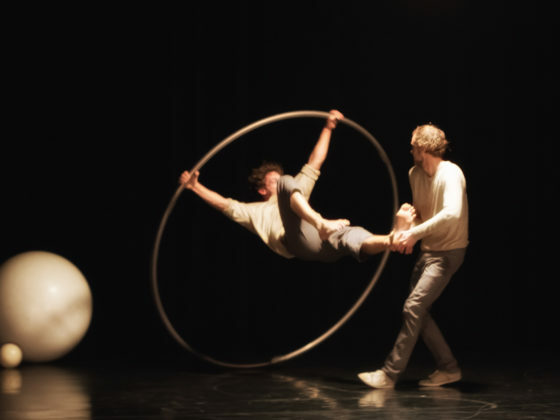 In the end, in a stage-room exchange integrated into the show or in a myriad of moving moments, it is of course the love of the circus that is obvious, as well as a universal questioning of our humanity. This Unidentified Artistic Object has the brilliance of sincerity, the beauty of time that passes and makes people more beautiful and more true. It shows what connects us to the world through the uniqueness of each story. Unique and universal at the same time. What a feat! “Talkshow”: when the magic of the feat gives way to the more discreet charm of the confession. Neither entirely a conference nor really a show, Talkshow has become a spectacular conference. A very free moment of speech where the vulnerability of the being and his sincerity would take precedence over physical performance. He then surrounds himself with singular personalities, with an atypical background. One of the characters, with his long hair and loose clothes, is constantly looking for movement. Impatient, he chirps and agitates frantically. The other, more discreet, shows a real obsession with immobility. He keeps “storing” his balls. But they are made to roll, and soon he is the one who is manipulated by them. Unlike a juggler, he is carried, thrown and rolled by his own ball. The (good) surprises follow one another and the audience, between laughter and breathlessness, seems unanimous. The ballet is running smoothly. And is far from making us dizzy. It is beautiful. 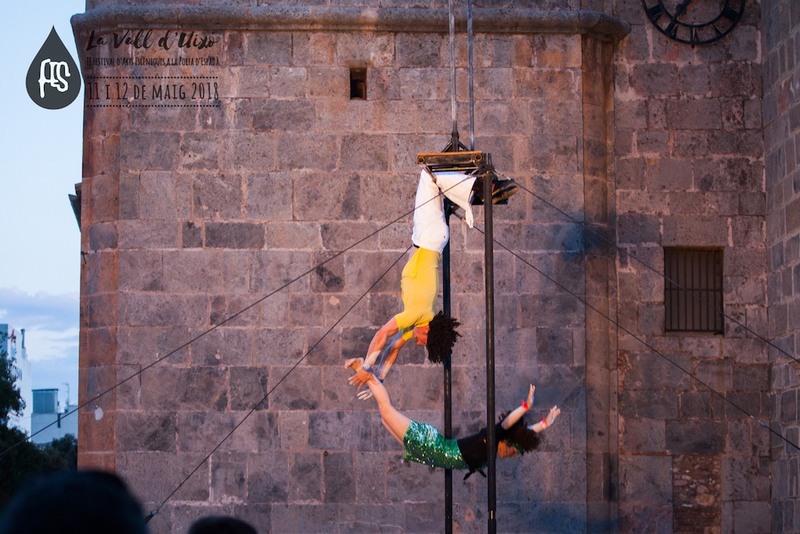 Nothing is imposed, the whole being based only on our ability to be moved and to appreciate at its true value the technical performances of the 2 acrobats. Respire is people’s favorite. Magnificent Belgian artists, an incredible technical level. A little masterpiece that goes straight to the heart. No element arrives where it is expected, and every gesture, every note, every impulse is inhabited by a presence of great quality that makes the stage a space where the energies projected by the five performers resonate and converge. In this cartoon world, everyone is trapped in their own madness, and transforms it into a space of freedom and joy, each thanks to the other. The energy and colour of the show are communicative. In their pursuit races – among themselves and with the accessories – there is a very pleasing slapstick dynamic, to which the children are very receptive. Strange one man show where juggler Loïc Faure fights against the bars of two cages, one large and one small, like the artist who locks himself daily, for hours in gyms, struggling with technique to free his desires as an acrobats. Climbing like a cat on its metal traps, fighting with its own chains, juggling with an ocean of balls in an elusive ballet, it offers a poetic metaphor of the circus. Braving the confinement, at the borders of the absurdity of a system, he offers a beautiful ode to obstinacy against all odds, showing the foolishness of men trapped in their certainties. 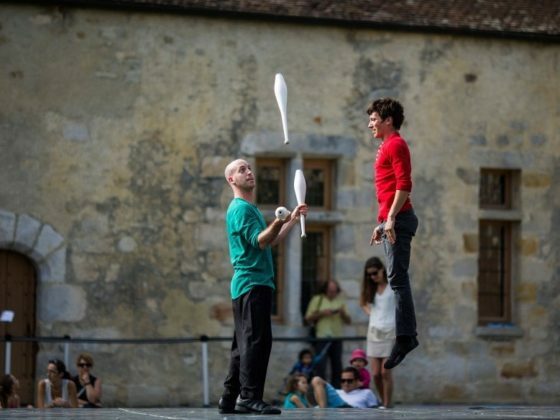 An explosive show with subtle light effects, which combines juggling, acrobatics on the ground, hand to hand and unicycle. 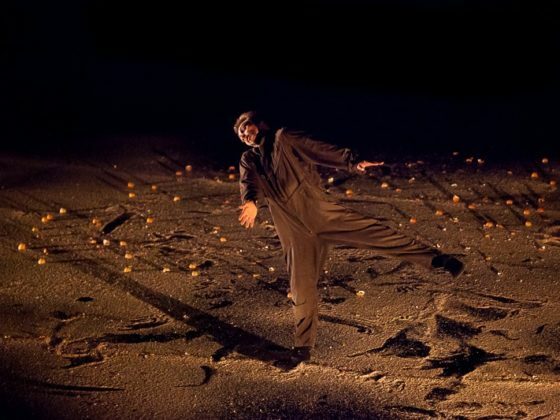 The Lapsus Company offers a performance that reminds us of pieces such as Oh les beaux jours or En attendant Godot. The performers’ playing is subtle and the scenographic universe is sober while being as abundant. With a Buster Keaton humor, they celebrate the pleasure of being together, despite the difficulties of the world. A show that makes you smile! The actors are superb in their agility and you can only see them on the big stage, almost devoid of artifice. A beautiful show to dream and travel in poetry. In Arabic, Boutelis refers to sleep paralysis, the feeling of being immobilized or strangled by someone, and its creators have chosen a darker world where space seems to constantly question beings: how to get out of oneself and from here? How to escape? Reflection on fantasies, the great mystery of the Other that bothers us, manipulates us, takes us away or supports us, is subtle. With identity issues treated with powerful specular fantasies. We tasted the adjustments of this Siamese couple who is looking for its way on a unicycle and this beautiful man with high heels. 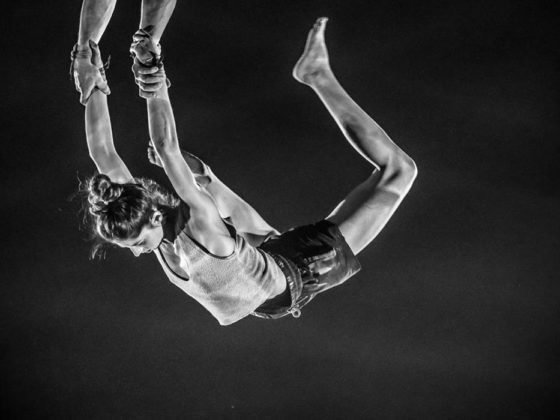 At the crossroads of theatre, circus and aerial performance, Shake, Shake, Shake, Shake generates unexpected surprise effects. The aerial evolutions are accompanied by extravagance, the public is having fun and gives it back to the artists with a hearty applause. A cascade of laughter and delirium goes from one to another, the artists of the PakiPaya Company bring together children and adults. Shake, Shake, Shake, Shake, a simply brilliant show, a great moment of the 2014 edition of Parade(s). The tandem, because it is actually one , offers ten minutes of acrobatics, real acrobatics, which leave no room for inexperience or chance. Bluffing, certainly… but perhaps not as much as the prey’s acting talents. The tableaux follow one another, framed as closely as possible by a work on sound and lighting. Dressed in an eloquent soundtrack, the young women run up, graze the ground, embrace eternity and grab us. At the limit of flight, they explore this fleeting state of floating, an inexhaustible space for research. All in grace. 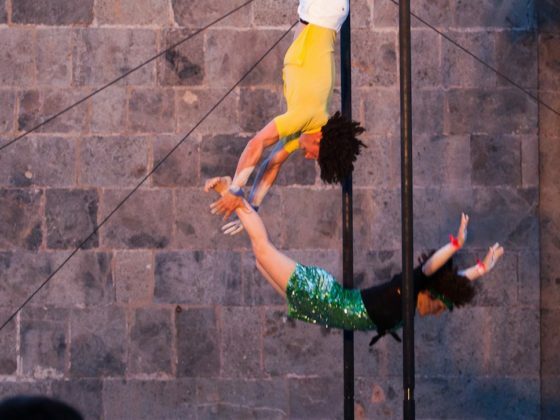 This circus is an incredible cinematographic ballet of beauty. Célia Casagrande-Pouchet and Sarah Devaux lead us to the limits of adult tales. 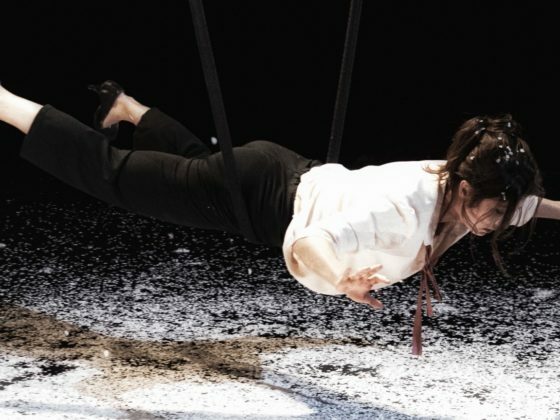 Between dream and reality, absurd and anguish, a remarkable show presented as part of the Up! 2018 festival.